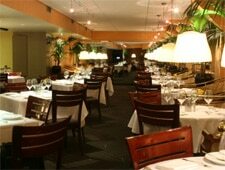 Classic restaurant close to downtown hotels and offices. : This chic restaurant is named after The New Yorker magazine, and the flair is apparent in both the setting --- straight out of a silent movie --- and the menu's continental cuisine. The proprietors maintain the members-only feel of a swanky NYC supper club, while the adjacent café has a more casual air. Try the pappardelle with Tuscan boar ragù or the tournedos Rossini with sautéed foie gras and black truffle-Madeira demi-glace. Whatever you choose, peruse the wine list for an appropriate pairing. A “Chocolate Decadence” cake is among dessert options.